I was off in the corner, trying to hold back the nausea from my head spin. By the time the slow song came around, I had finished nursing my remedy potion and mostly regained my stomach, but not my nerve. I had wanted to ask Emily and Josh to dance for years now, the desire and reticence battling each other in my chest. I tried to calm myself by rationalizing why it wouldn’t be weird or selfish or imposing to ask for this dance. But they were instantly opposed by the notion that I hadn’t any more right to have this moment than any of the other patrons, let alone those who had contributed so much more than I. “But even a poor tailor is entitled to some happiness!”, I realized, and screwed up my courage just a notch past my fears and anxieties. I put on my most effusive facade, and started to walk toward Josh and Emily.........just in time to see them walking out onto the floor with somebody else. I stopped, coolly, calmly realizing the synergy of fate and my own inhibitions. I walked towards the doors and out into the cool night air to dance with my thoughts. I love that you picked Cam of Worms' track to end the series. It has a sweet and expectant resignation to it, but without any sense of mourning. I envision a young man or woman leaving their lifelong home on an Ohio farm, sitting in the back of a truck as their parents recede from sight. The youngster is heading toward the big city, but not to escape their life. They've gone with their parents' blessing, out to see the wide world. They have no regrets, only great appreciation for the experiences they've had, and expectation that the road ahead is the next step in their journey. I have a testimonial. I had wanted to write this into the campfire skit, but it felt a little selfish given the context of a group share(plus I was a part of the LJN Rainbow and Rastan arcade stories, so I was covered). Wow, Nemo. What a reflection. All I can say is that I truly do believe you patrons are some of the most wonderful people in the world, and I'm not surprised that you're all having such lovely affects on each other. The podcast was the substrate; you guys have always been the enzymes. I'm forever grateful to have been a part of this beautiful orchestra. I don't know who'd I'd be dancing with, I'm not that great of a dancer to be honest haha! Like I said before, It's been an honor and a privilege to have helped on this podcast, and I wish everyone here well! "When did Final Fantasy VIII come out on the PS2? I'm pretty sure that's a PSone game! :P"
Question: did anybody eventually usurp the title I held for most requests? Oh my gosh HAAAAJUUUU!!!!! T__T Cry forever! That was such a perfect song choice for this final episode. I have been thinking lately about the fictional characters birthed on this show like Haju, Hakama, Carrotman, Cookie, etc., and at first I was sad thinking that the end of the show would mean the end of their existence. But then I reflected on the fact that they were fictional co-constructions all along, so they have only ever existed in our combined thoughts, our memories, and our sharing. And just because the show is ending doesn’t mean that they are somehow removed from those places! So, they can live for as long as they are thought of, remembered, or talked about. This was a comforting thought, and a very VGMJB metaphysics kind of thought, because they are phantasms who exist in our collective consciousness, and even in the absence of corporeal form, they still have the ability to do things like request a Final Fantasy VIII song that then cuts straight to my heart and brings on the waterworks. Yet another song, that I will never hear the same way again. And isn't that where we all most want to exist for other people? In those heart spaces and memories? In those places where we really emotionally penetrate and affect one another in a way that moves us both and imbues our lives with a meaning it wouldn't have had without our shared movement into the head and the heart, into memory and emotion? In many ways, the best parts of ourselves are co-constructions not unlike our beloved VGMJB characters. Thank you all for the memories, everyone from this show, both the fictional and the real. You always live on in my wistful affection for you. Emily, Josh- thank you so much for everything! I was there from episode 1, and I loved every minute of it. When you started the show, I was pretty new to New York City and didn't really know anyone, and your podcasts kept me company as I took trains around the city alone. Now, years later, I have lots of friends here, but I still always made time for the VGM Jukebox! The tone of your show- the positivity, the humor, the welcoming of others- that's what defined it, maybe even more than the music. Every time I made a submission, I would listen to the show a little more closely- and it was such an adrenaline rush when I heard, "This next submission is from Marshe..." I listened to that part of the show over and over again. Oh yeah...I was trying to think of the things I always wanted to ask you guys over the years...lol I actually always hoped you guys would do an episode of "bad" video game music. I know it wouldn't really fit with the positivity of the show, but whenever I would find a track that was just painful/hilarious to listen to (my submissions would be: the title music of Crazy Bus, Agent X from WWF Attitude, and my favorite- the national anthem from Double Dribble Arcade) I thought it would be really funny to do a podcast where you try to find the good in "bad" songs. I'm not sure why, but I also always wondered how big our little community was- how many people actually listened to the podcast weekly! I felt a little sad when the show ended, as I did when the Legacy Music Hour first did. I had a weird fear...that maybe fans of classic video game music, who are mostly in their mid to late 30s, are starting to get too busy in their lives to keep doing podcasts like these. I hope that isn't true, and shows like this continue for a long time! But actually, I don't feel sad anymore- just happy for all the time we all spent together! I only have one wish- I really hope that when I tune in in December, Emily announces she's been migraine free for months and it's changed her life! That would be the "best ending"- which I feel I've earned, since I 100% completed all the episodes. Great episode and a sad one, I'm really sad to have this end but it was a great run listening to you guys. I'm saddest that I won't be hearing both your voices as much in my life anymore. You guys entered my ears and feel like friends that I've never met now. And Emily the story about your migraine medicine hopes made me tear up. As someone with chronic problems my self (tinnitus and vertigo) when you were talking about how you feel like you might be free soon I know exactly how you feel and I'm really glad you have that hope to look for. Here's hoping! Josh, I hope to hear from you on other podcasts soon, you always seem like a go getter and DO-er and I admire that drive. Good luck to you both and any time you get the itch that you may want to come back.... I'll be back with a quickness! I love a great beginning, middle, and end! VGMJB going out on a high note! I got into this podcast when I got into podcasts in general! It was when I got this new data entry job that I've been at ever since. So it's always been special to me for these past three years and was my go to routine to queue up the new episode every Saturday morning at the start of my super early shifts. The variety was always so awesome and fresh, I never knew what kind of episode it would be but I always knew it would brighten up the start of my day. Always brought me a smile. Now I'll have to rattle that routine a bit and discover something else, but nothing will ever replace the VGMJB. Change is good and I love that you both have some exciting new ventures brewing up with this new freed up time. It's hard and exciting to let go and embrace whatever chapter is next. Emily and Josh, thank you for all this fun content and the memories that will remain, YOU mean so much to me and you always will. Cheers! Excellent final episode. Ever since I began listening this has been my favorite podcast. I'm sad to see it go, but happy for all it did for me. Every time I listen to the podcast, listen to music I discovered through it, or even think about it I feel that I'm with friends. The second album which has meant a lot to me was given to me by my grandparents. I grew up in Puerto Rico and miss the nighttime sounds of the coquí, a small native frog with a distinctive call. The album is called Caribbean Rain Forest Songs by Entre Amigos and has a single hour long track entitled Coquí. Most of it is nature recordings of the lovely nighttime sounds I miss, but it is also occasionally interspersed with short native musical compositions. I can't find it online, but I can share an mp3 of it to anyone who is interested. You guys also put the call out for the odd thing that we love that others find strange. I love that my odd thing is actually VGM. I first got into it back in high school when I discovered some of my PC CD games had the music as listenable tracks. 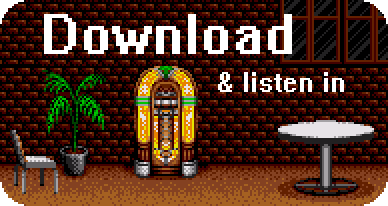 When I got to college, I enjoyed downloading VGM covers through file-sharing services. That's how I discovered the Minibosses and the NESkimos. It was sharing this music with a friend that led me to LMH. But I already told that story last week. I also wanted to thank Josh for talking about Pokémon Go on the podcast and even mentioning Trainer Tips. I created my account on day 2 of release, but didn't really play much at all and let it go early on. When Josh started talking about it on the podcast I decided to give it another try. A year and a half later, I still play every day and am lvl 38. If Josh or anyone else who plays is interested, my trainer code is 5526 7558 5311. Hit me up and we can be digital friends in yet another way. You all mean so much to me, and you always will. We've finally come to the end of the show. This was more than just a podcast. It was like hanging out with friends I never met, listening to great tunes and sharing memories. Hearing familiar voices read our words and react to our favorite music and memories was something that gave this show a level of interactivity unparalleled in podcasting. I also loved all the little opening skits, they were so clever and fun- the perfect thing to get me in the mood to hear some awesome vgm. Thanks Josh and Emily! I wish you the best of luck in all your future endeavors. I'll be sure to keep an eye out for them. I would also like to thank all the patrons who suggested all this great music and poured their hearts out with their amazing testimonials. It's been said before, but it bears repeating: You mean so much to me and you always will.